Got my first box and was very pleased. There was one item though, a bracelet that I know I won't wear. I plan on saving to re-gift later though! I just got my first box, and have scheduled a pamper-me night to use everything that was in it! 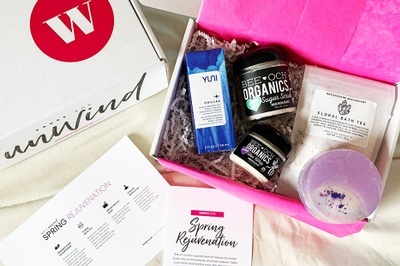 I'm looking forward to trying it all out - I would never think to buy some of these items individually, and it's nice that what shows up as a surprise: takes a decision out of your life and let you enjoy someone else thinking about what would be good for you for a change! I have every hope that the Feb box will be more satisfying and will update accordingly. Got my first box at the beginning of January. Loved the strawberry champagne loose leaf tea and the essential oil blend. I also very much enjoyed reading the little greetings from all of the women behind the products, It made me appreciate them more. My only complaint is that it included bath salts which I cannot use because I don't have a bathtub! But I'm going to hang on to them and use them when I can. This box is nice because you don't need a reason to use any of the products besides a quiet night at home. This was gift to my mother. She loved her first box! She loved reading the stories of the women who created the production and said it was so inspirational. This was something I was really looking forward too, I was a little disappointed with the first box... I was expecting more products like the ones you see in their pictures, bigger sizes, I was just expecting something a little more woah for my first box ever.. it was just not what I was expecting. But I’m going to give it one more try, so see if I will continue... so I’ll keep you guys posted.